Photograph: Courtesy sunrisesoup via flickr Vaux's Swifts will be swooping through Downtown tonight. 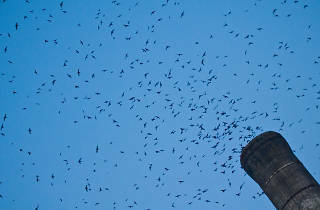 It happens every year: a swarm of birds swoop into Downtown LA by the thousands, their eyes all on the same, singular chimney. They are the Vaux’s Swifts (Vaux’s sounds like foxes), a swallow-esque bird unable to perch, instead clinging to narrow spaces to use as roosting sites until they continue their southward migration to Mexico and Central America. To celebrate the Swift’s fall migration, Ace Hotel is hosting a Birds and Beers event for free at Upstairs, the hotel’s rooftop bar, starting at 4pm tonight. Ornithological expert and park ranger Anthony Bevilacqua will be on hand to answer all your burning questions about the Vaux's Swift—How many are there? How long will they stay? 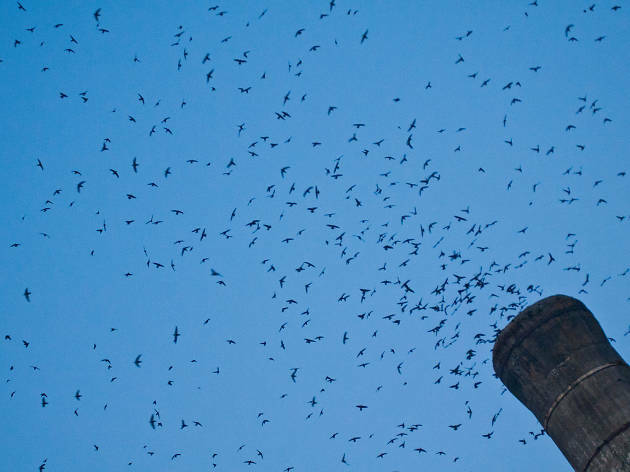 Do birds get claustrophic?—as bird enthusiasts sip on beer and watch the flock swirl, tornado-like, into their old chimney roost on Broadway between 4th and 5th street. The viewing party goes until 7pm, and there is no reservation necessary. Just show up, crack open a beer and watch a scene from The Birds come to life—just, you know, without the fatal pecking.